Inside every skateboard wheel there are two ball bearings to allow the wheel to spin on the axle. 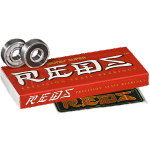 Basement Skate stock the best range of skate industry standard ‘608’ sized bearings, defined as having an 8mm core, 22mm outer diameter and a 7mm width. Abec rating is a very commonly used term in bearings. Abec stands for ‘Annular Bearing Engineering Committee’. The Abec is similar to the ISO rating, which is a French acronym for ‘International Organisation for Standardisation’. These rating is an indication of the allowable tolerances in the dimensions of the bearing with ISO measured in millimetres and Abec measured in Inches. These standards control the internal and external dimensions of the bearing, as well as the width. It is worth mentioning however that the ABEC rating was designed to evaluate bearings for use in machinery, not in skateboard wheels. As a result, the tolerences measured do not factor in forces that are exclusive to skateboarding. 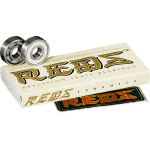 So while many skateboard bearing manufacturers still provide ABEC ratings for their products, riders should know that they are not end-all. The internal clearance of the bearing is related to the space between the balls and the raceways. A skateboard bearing is designed to take mainly radial load (vertical load) and some axial load (side load). A bearing with larger clearance or ‘deep grooves raceways’ will allow the bearings to perform under greater side load. Side load is an important factor with soft wheels when railing hard corners and sliding in any capacity. A cheap bearing under load will not spin as freely as the raceways are not as round. The cage inside the bearing holds the balls in the raceway. Steel cages don’t allow for as much roll speed as nylon cages. Nylon cages allow better sliding characteristics and slightly lower noise. 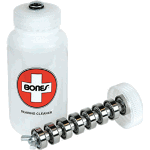 A nylon cage is also more forgiving if the bearing is dirty or under lubricated. Bearing shields help keep debris out of your bearing and can be made of rubber or metal. 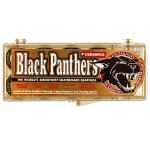 Rubber shields have a lower resistance and tend to be the better choice. Some skaters will pop off their shields, which will sound louder. Sounds better and looks cooler, but you’ll be buying new bearings sooner. Contact seals rub on the inner ring of the bearing, creating an effective seal from debris. However, greatly increase bearing resistance. Non-contact seals are design gives better protection than metal shields but without the drag caused by normal contact seals. Non-contact seals can be easily removed and re-fitted when you clean and re-lubricate the bearing. 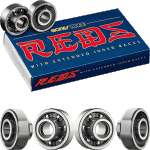 Built-in bearings have an elongated inner race on both sides, acting as the bearing spacer and speed ring/washer. Built-in style bearings are designed to increase the precision of a bearing by minimising unwanted movement. The design allows the bearing to perform better under a higher side load, like when you are laying down huge power slides or railing fast corners. Because the bearings can be cranked onto the axle, the bearing will be running more parallel / true, which will give your bearings increased longevity. 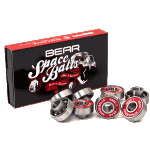 We stock Built-in from Bear, Biltin, Bones and Free Wheel Co.
6 Ball bearings can handle higher speeds and accelerate faster than a regular 7 ball bearing. The Balls are 20% bigger in a 6 ball bearing (3/16”), than a 7 ball bearing (5/32” size balls). 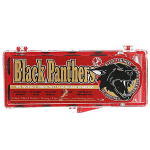 This bigger ball size offers lower starting and rolling torque (rolling resistance), which means more speed and longer roll time. The bigger balls can take higher loads / impacts as the balls are tougher. 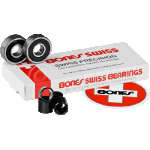 We stock 6 ball bearings from Bones and Hardluck.